This guest post is an extra special one. 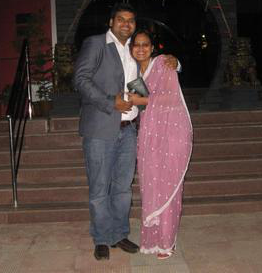 Abhijeet is a friend who got married in 2011. His wife, Puja, is truly a lucky girl, her husband is a poet! He wrote her a few beautiful lines in Hindi, and I’m sharing them here with you. Apne takiye ke niche ek khwab sulaya karta tha. Apne takiye ke niche ek kwaab sulaya karta tha. How many of you are wishing right about now that your husband was a poet/writer? this is so sweet! AB also asked me out through poems.. and i love him for that!